Take Your Child to Work Day is gaining momentum in the state of New Jersey and provides an opportunity for children to experience what mom and dad do in their careers while the kids are busy at school. It’s a fun time for all and helps build a bond between staff members and their children. Commence Corporation supported this initiative by creating a few activities for the kids so they could learn about what the company does and how we assist customers with their business requirements. This year the kids were given a series of fun challenges to encourage teamwork and to learn about the features of web based CRM software. Create a new company logo. Search for an image to use in a blog article. You can see the results of this challenge on the Commence CRM Blog. Guess the number of jellybeans in the jar. And a tough challenge… untangling a box of computer cables. Their day ended with lunch and an outdoor recess. We love the results of their work! What do you think? 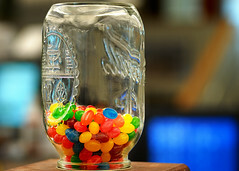 Image “soma dispenser” (jellybean jar) by Troy McCullough on Flickr under Creative Commons license.